Previously: Moose went to the American Top Team gym in search of Bobby Lashley but got beat down and thrown out by ATT. Tonight: Johnny Impact faces Garza Jr. with the winner getting a title shot at Bound for Glory. Plus, Moose returns to the American Top Team gym with UFC legend Stephan Bonnar. - LAX made their way to the ring. Konnan demanded that LAX get their rematch with OVE at Bound for Glory. OVE came down to confront LAX, then Konnan informed them that the title match is going to be a 5150 street fight. Diamante grabbed the mic and told Dave Crist that 5150 means it’ll be all of LAX in the match. She slapped Dave and a brawl broke out. Santana and Ortiz used an RKO on Dave onto two chairs and then sent Jake Crist through a table. - Clips of a Pro Wrestling NOAH press conference featuring Eddie Edwards, Naomichi Marufuji, Eli Drake, and Cody Hall aired. Rosemary completely dominated and won the match easily with the Red Wedding. After it was over, she grabbed the mic and called out Taya Valkyrie. Valkyrie and Rosemary faced off when Valkyrie suddenly spit the mist in Rosemary’s eyes. She followed up with her Road to Valhalla finisher. 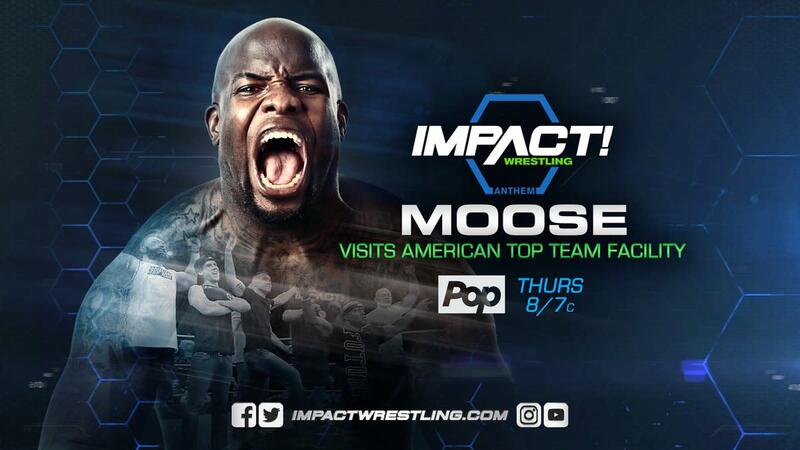 - Moose is going back to the American Top Team gym, but this time he's bringing backup. - Taryn Terrell came out and ran down Gail Kim. She mentioned Kim’s husband Robert Irvine, calling him “Bobby” in a seductive way. Kim came out and told her the mind games won’t work. Kim believes in karma and said karma will slap Terrell before she does. Kim ended up slapping Terrell out of the ring. - A video hyping the return of Alberto El Patron at Bound for Glory aired. - Jim Cornette announced Taya Valkyrie vs. Rosemary for next week. - Grado arrived outside of the Impact Zone exhausted. Joseph Park showed up in a fancy car with a bunch of women, with one of them calling Grado Park’s meal ticket. Grado was furious. Allie ran wild on Sienna to start the match. Texano cut off Storm and isolated him in their corner, then Sienna tagged herself in and beat down Storm. Xavier was able to get the hot tag and score a close near fall on Konley. Allie gave Texano a codebreaker and took out Sienna on the floor. Xavier climbed to the top, but Lee tripped him up. Storm nailed Konley with the Last Call to win the match. This was just clips of a match where Edwards retained the championship by hitting the Die Hard Driver. - Moose returned to the American Top Team gym but this time brought former UFC fighter Stephan Bonnar with him. They entered the gym with metal pipes. Garza nailed a superkick for a near fall and worked over Impact. Impact made a brief comeback and scored a two count. They traded shots in the middle of the ring until Garza hit a standing moonsault for another near fall. Garza attempted a Boston crab, but Impact rolled him up for the win. Johnny Impact will challenge Eli Drake for the GFW Global Championship at Bound for Glory. After the match, Jim Cornette interviewed Impact until Chris Adonis ran out and broke a wooden board over Impact’s head. - Back at the ATT gym, Moose and Stephan Bonnar entered the gym looking for Bobby Lashley, King Mo, or Dan Lambert -- but none were there. They destroyed the gym with the metal pipes and stole championship belts. Next Week: The build for Bound for Glory continues. Plus, Taya Valkyrie vs. Rosemary.